Feral Smokey first started coming to my home during the winter about 7 ½ years ago. I fed him and provided places for him to sleep safely and warmly under my side deck and talked with him when I saw him. 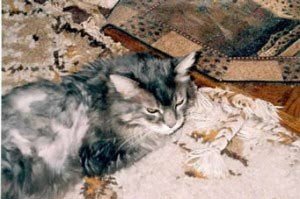 Smokey Kitman is a large, long haired grey feline with tabby markings on his handsome face. He is quite vocal, even now that he is inside, with a hoarse meow. Until the middle of last summer his long fur always looked healthy and immaculate. Then it started getting matted, a situation which became worse as time went on. He started eating more and drinking a lot of water and had less energy. When I asked about him drinking so much water, the vet suggested more blood tests, which were done. He is diabetic. 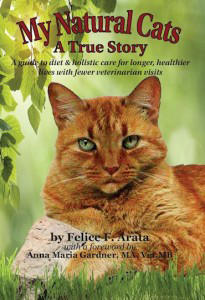 The vet recommended feeding him a prescription diet made for diabetic felines and starting him on insulin shots. I decided to try natural methods, since I am feeding all of my indoor felines a healthy, raw diet made with Feline Instincts No Bones About it supplements, salmon oil, ground beef and turkey and a few other added goodies. He is given no dry food since that has grains in it which convert to sugar. Shots would not be possible as Smokey is still feral. His health seems to be getting better. His fur is growing back well and he is eating and drinking less than he was when he first came in. I am very glad that Smokey decided to join our household and live inside with me and my other felines, and that I have raw diet to feed him. His energy is very sweet, even though he’s still nervous about people.